Simon Says Pop It Up! We are showcasing Lawn Fawn Products this week! You don’t have to use them to join in with the challenge but if you have some we would love to see them used! I LOVE Lawn Fawn’s Pop Scalloped Box Die. So easy to make pop up cards and I enjoy making it. 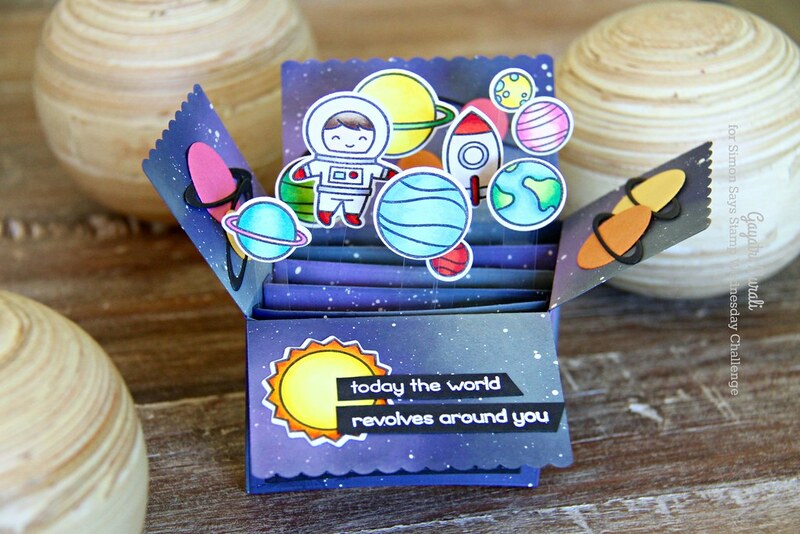 I also used Out of this World stamp and die set from Lawn Fawn to make my galaxy pop up card. 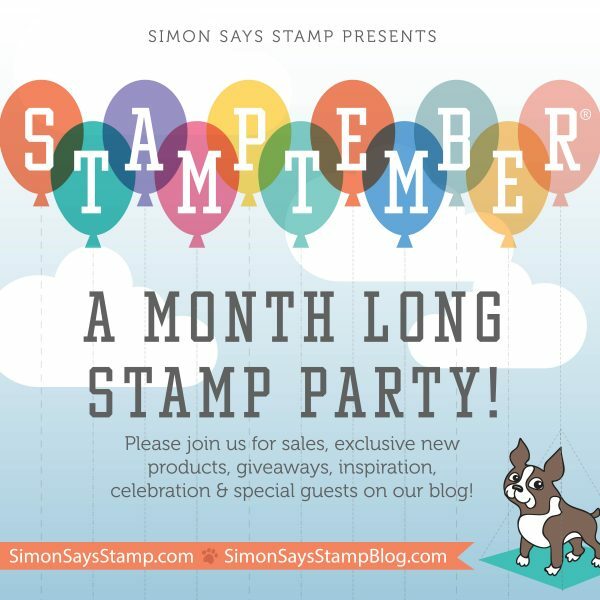 I used Royal Purple cardstock from Simon Says Stamp as my cardbase. I die cut all the elements for the pop up card using the Royal Purple cardstock and the Pop Up Scalloped Box die. I sponged Distress Oxide inks – Picked Raspberry, Twisted Citron, Wild Honey and Black Soot on all the elements and spattered copic opaque white to get the galaxy look. I did this on all sides of the elements. I then assembled the pop up box. 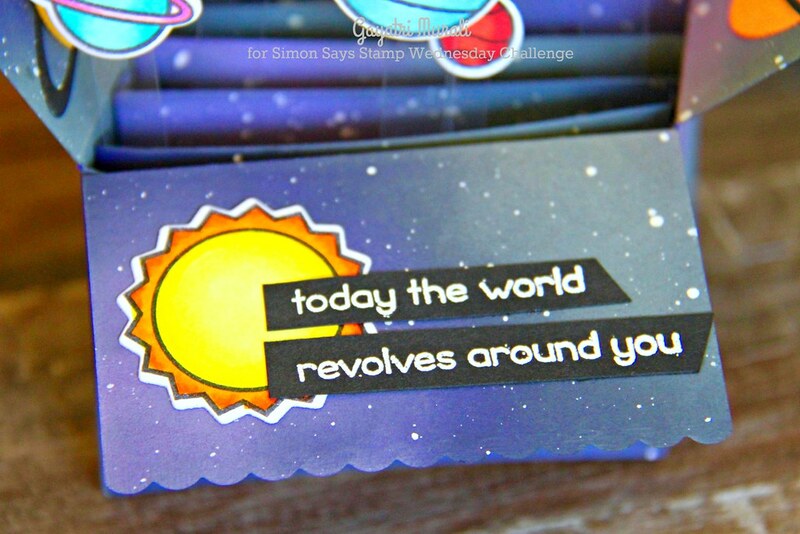 Then I stamped all the planets, sun, astronaut and the rocket from Out of This World stamp set using Simon’s Intense Black Ink and coloured them all using copic markers. Then I die cut them all out using the coordinating dies. I used strips of acetate sheet to add the pop up elements on the box. 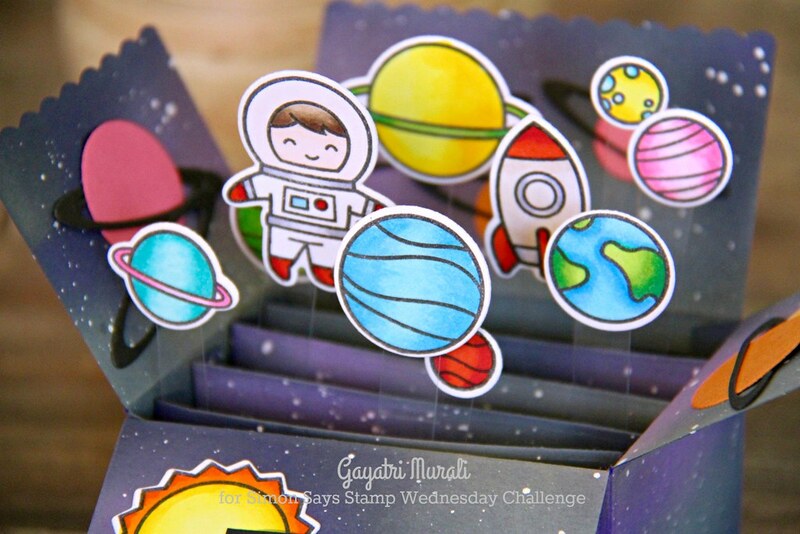 On the sides of the box, I used Simon Says Stamp, Space Journey die to die cut some planets in different colours and adhered on the sides. One the front panel, I adhered the sun and added white heat embossed secondary sentiment on strips of black cardstock. The main sentiment is on front on the pop up box. I die cut the stitched black panel using the die from the Pop Up Scalloped Box die set and white heat embossed the main sentiment. 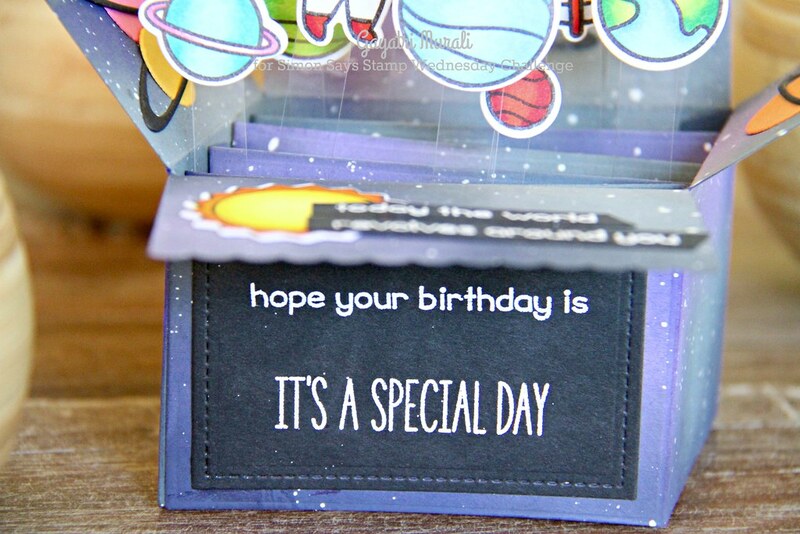 The sentiments are from lawn Fawn Out of This World stamp set. I love how this card turned out. Very cool. So now it’s YOUR turn! If you like to pin my card on your Pinterest boards, here is my pin for you. You ROCKED this challenge, Gayatri! Love love the space them and use of LF products! Coolest card ever Gayatri~love the details!!! Not that difficult Wanda! The die makes it easy. I was like you until I pushed myself to make one and then felt da, why did I shy away from it for so long 🙂 Thanks so much for your comment. 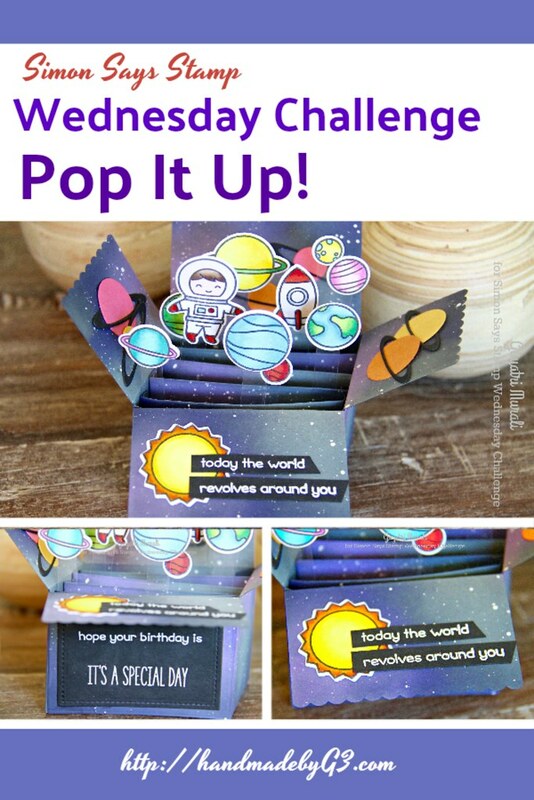 lovely pop up box, it’s so cute! I love the galaxy background!